It takes a village to plan and pull off a successful Master Gardener plant sale year after year. Willing volunteers dug up and donated their plants last October. Another generous gardener allowed us to use his garage to pot up those plants and offered to overwinter them in his vegetable garden. Starting in January, the plant sale committee ramped up, met on a regular schedule, and kept things on track. 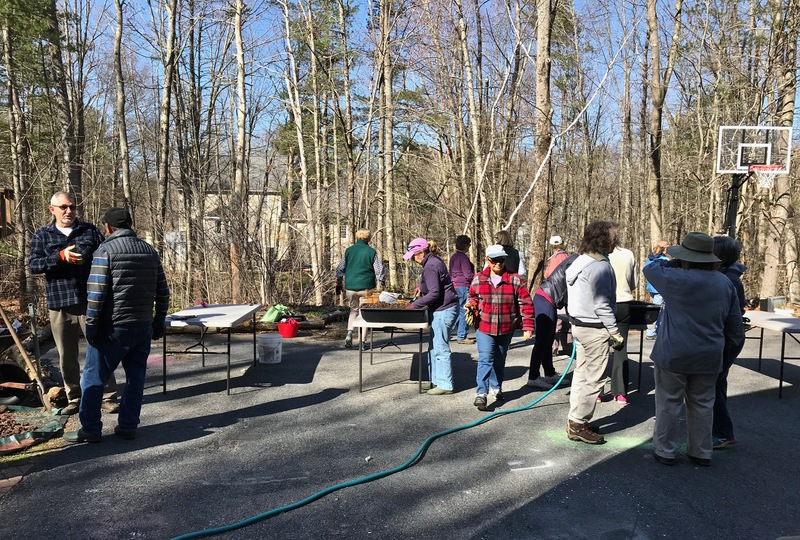 April rolled around, the snow was barely melted, but we were able to have another potting party for donated plants at another volunteer’s home. Plant sitters once again kept the plants pruned and watered for the sale. Then along came the ladies who visited the homes of the sitters to price plants. The day of the plant sale arrived, there was a forecast for rain, but we lucked out with only a few sprinkles. By 7 a.m., the parking lot of the Durham Town Hall was busy with a full crew setting up tents, tables, and signs, unloading trucks of plants, and getting things organized. Along came others who worked the sale, talking to potential buyers. Information was provided about a wide variety of gardening topics from annuals, perennials, vegetables, fruits, soil testing, invasive worms, and how to become a Master Gardener. 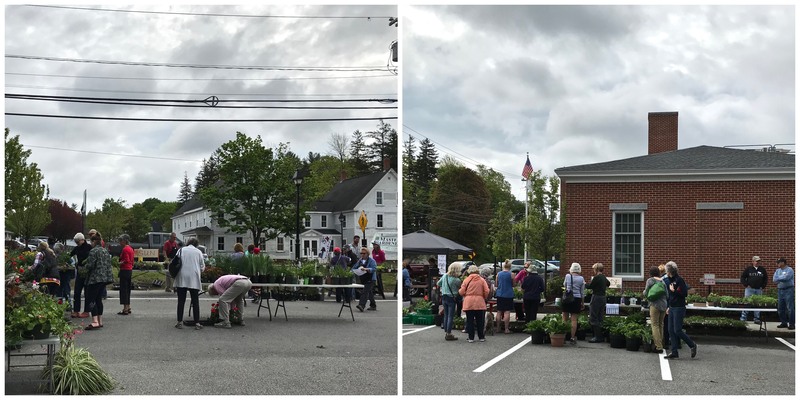 After four hours of selling, the tents came down, equipment was returned to owners, some plants were saved for projects, and the rest were donated to the Friends of the Barrington Library perennial sale that just so happens to be today. 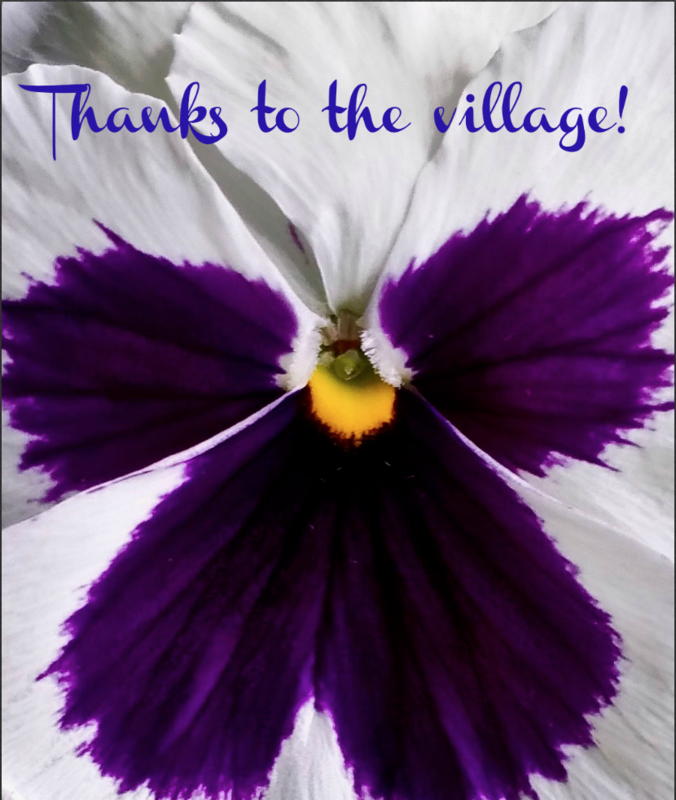 So, when you visit our plant sale know that there is a village of volunteers who work hard behind the scenes and who sincerely appreciate all the people who stop, ask gardening questions, and support us by buying plants. Happy gardening this summer, and we’ll see you next year. By the way, if you have questions this growing season, there is a crew of NH Master Gardeners just waiting to answer them. Walk in: 329 Mast Rd, Ste 115, Goffstown, N.H. This entry was posted in Plant Sale and tagged Ask UNH Extension, Barrington NH Public Library, Friends of the Barrington Library, Gardening, Master Gardeners, New Hampshire, Plant Sale, Strafford County, Strafford County Master Gardeners, UNH Cooperative Extension. Bookmark the permalink. We, too, have great volunteers who work really hard to make our plant sale a success each year!